Frederick Turner was born in Northamptonshire, England, in 1943. After spending several years in central Africa, where his parents, the anthropologists Victor W. and Edith L. B. Turner, were conducting field research, Frederick Turner was educated at the University of Oxford (1962-67), where he obtained the degrees of B.A., M.A., and B.Litt. (a terminal degree equivalent to the Ph.D.) in English Language and Literature. He was naturalized as a U.S. citizen in 1977. 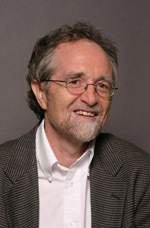 He is presently Founders Professor of Arts and Humanities at the University of Texas at Dallas, having held academic positions at the University of California at Santa Barbara (assistant professor 1967-72), Kenyon College (associate professor 1972-85), and the University of Exeter in England (visiting professor 1984-85). From 1978-82 he was editor of The Kenyon Review. He has been married since 1966 to Mei Lin Turner (née Chang, a literary periodical editor), and has two sons. Shakespeare and the Nature of Time (Oxford, Clarendon Press, 1971: criticism); Between Two Lives (Wesleyan University Press, 1972: poetry); Shakespeare’s Romeo and Juliet (London University Press, 1974: edition with notes and introduction); Counter-Terra (Christopher’s Books, 1978: poetry); A Double Shadow (Putnam’s/Berkley, 1978: a science fiction novel); The Return (Countryman Press, 1979: poetry); The Garden (Ptyx Press, 1985: poetry); The New World (Princeton University Press, 1985: an epic poem); Natural Classicism: Essays on Literature and Science (Paragon House, 1985) (Reprinted in paperback by University Press of Virginia, 1992); Genesis (Saybrook Publishing Co./Norton, 1988: an epic poem); Rebirth of Value: Meditations on Beauty, Ecology, Religion and Education (State University of New York Press, 1991); Tempest, Flute, and Oz: Essays on the Future (Persea Books, 1992); Beauty: The Value of Values (University Press of Virginia, 1992); April Wind (University Press of Virginia, 1992; poetry); Foamy Sky: The Major Poems of Miklós Radnóti (with Zsuzsanna Ozsváth; Princeton University Press, Lockert Series, 1992: translations from the Hungarian); The Culture of Hope: A New Birth of the Classical Spirit (The Free Press, 1995); The Ballad of the Good Cowboy (The Maverick Press, 1997), Biopoetics: Evolutionary Explorations in the Arts (Paragon House Press, 1999: edited volume of essays by various hands, with Brett Cooke), Hadean Eclogues (Story Line Press, 1999: poetry); Shakespeare’s Twenty-first Century Economics: The Morality of Love and Money (Oxford University Press, 1999); The Iron-blue Vault: Selected Poems by Attila József (Bloodaxe Books, 1999: translations, with Zsuzsanna Ozsváth); On the Field of Life, on the Battlefield of Truth (Pivot Press, 2004: poetry); Paradise: Selected Poems, 1990-2003 (David Robert Books, 2004: poetry); Natural Religion (Transaction Publishers, New Brunswick, NJ, and London, 2006); Në Shpellën e Platonit (“In Plato’s Cave”, full-length collection of poems by Frederick Turner translated into Albanian by Gjekë Marinaj; Marinaj Publishing, Dallas, Frankfurt, Tirana, 2006); The Prayers of Dallas (poetry; Turning Point Press, Cincinnati, Ohio 2006); Frederick Hart: The Complete Works: Essays by Donald Kuspit and Frederick Turner. Butler Books, Louisville, 2007. This list may not be completely up-to-date. Check the books page for more recent additions. He contributes essays, poetry, reviews, and translations to many periodicals, including Harper’s Magazine, Smithsonian Magazine, The Wilson Quarterly, Poetry, Reason, Forbes ASAP, Society, The Journal of Social and Evolutionary Systems, The American Arts Quarterly, Pivot, New Literary History, Oral Tradition, First Things, The Southern Review, The Yale Review, The Missouri Review, The Ontario Review, The National Review, The Reaper, The Denver Quarterly, The Plains Poetry Journal, Crazyhorse, Edge City Review, The Journal of Social and Biological Structures, The Study of Time, The Southwest Review, Measure II, The Hungarian Quarterly, The Partisan Review, Shenandoah, The Stanford Literary Review, American Enterprise, The Evansville Review, The Humanist, Chronicles, Zone, Lapham’s Quarterly, Common Knowledge, The Formalist, Hellas, The Chaucer Review, American Theatre, and Performing Arts Journal. He has appeared on two PBS TV documentaries, The Elephant on the Hill and The Web of Life, in the prizewinning Smithsonian World documentary series, and on the Discovery Channel’s science documentary Understanding Beauty. He has also been interviewed several times on National Public Radio, BBC, CBC, and other radio broadcasts. His work has been translated and published in Albanian, French, German, Japanese, Hungarian, Italian, Macedonian, Rumanian, Russian, Spanish, Turkish, Vietnamese, and other languages. He has lectured or given poetry readings at over two hundred institutions in the U.S., Canada, and Western and Eastern Europe. As a poet he is known especially for his use of the longer genres, the narrative, science fiction, and strict metrical forms, and his work in these areas has been widely discussed. He is a founder of and spokesman for two recent and influential movements in contemporary American poetry, the New Formalism and the New Narrative (sometimes named together as Expansive Poetry). His epic poems The New World and Genesis have been the subject of several critical studies, theses and dissertations. Some of his poems have been set to music by the composers Stefania de Kenessey and Claudia Gary. As a literary and cultural critic he was first known for his Shakespeare criticism and for his scholarship in the field of English Renaissance philosophy. In recent years he has written on Renaissance science and art, Shakespearean theater and performance, Christopher Marlowe, The Tempest, Hamlet, Twelfth Night, and The Merchant of Venice, and his book Shakespeare’s Twenty-First-Century Economics has met with critical acclaim. He is a founder of the literary-critical school known as Natural Classicism. His three most recent books of essays and his monograph on beauty explore these ideas. A founder and board member of the International School of Theory in the Humanities, and the Georgia-based Institute of Global Studies, he has helped create institutions that express and develop his cultural ideas. Another emphasis has been on the relationship between science and technology on one hand, and the arts and humanities on the other. He has thus been involved in groundbreaking studies of the neurobiology of esthetics, the ritual and performative roots of the arts, and the humanistic implications of evolution, ecology, recombinant DNA technology, space travel, artificial intelligence, brain science, and chaos theory. His book The Culture of Hope: A New Birth of the Classical Spirit assesses the chances for a revival of our cultural energies at the turn of the millennium, based on the remarkable new developments in scientific cosmology and technology. He has been a leading theorist of restoration environmentalism, staking out, with William R. Jordan III, a new vision of the human place in nature, where human welfare and technological progress can work with, rather than against, natural evolution. His contributions as an interdisciplinary scholar have been recognized, cited, or published in the fields of literary and critical theory, comparative literature, anthropology, psychology, neuroscience, sociobiology, oral tradition studies, landscape architecture, photography, planetary biology, space science, performance theory, photography, education, the sociology of knowledge, ecological restoration, political philosophy, the physics of computation, theology, the history and philosophy of science and technology, translation theory, audiology and speech pathology, Medieval and Renaissance literature, philanthropic theory, media studies, architecture, and art history. He is or has been a member of several research groups, on subjects including the biological foundations of esthetics, artificial intelligence, ecological restoration, law and systems research, time, interdisciplinarity, the sociological study of emotion, chaos theory, and ecopoetics. His essay (with the distinguished German neuropsychologist Ernst Pöppel) on the neurobiology and cultural universality of poetic meter has been widely cited and reprinted, as have his essays for Harper’s on modernism, education and environmentalism. He is an adviser to the Society for Ecological Restoration and a contributor to its periodical, Restoration and Management Notes. He has been a consultant to NASA’s long range planning group, and was invited to the Ames Space Center in California with Carl Sagan, Christopher McKay and other experts in 1991 for a workshop on Mars terraforming. He has been a contributing editor for Reason Magazine and Tech Central Station. He is or has been an advisor to the Journal of Social and Biological Structures, Hellas, Poems and Poetics, The American Arts Quarterly, American Enterprise, Discrete Chaotic Dynamics in Nature and Society, the Djerassi Foundation, the Quest Foundation, the Newington-Cropsey Foundation, the Peace University of Berlin, and the Werner Reimers Stiftung research group on biology and esthetics, and is a Fellow of the Dallas Institute of Humanities and Culture. He has been a trustee of the Greenhill School and the Isthmus Institute, and is the literary adviser for “Wishbone,” the prizewinning children’s literary TV series. He has been an editorial reader for the University Press of Virginia, the Free Press, the University of Missouri Press, The University of Illinois Press, SUNY Press, Behavior and Brain Studies, Mosaic, the University of Pennsylvania Press, MIT Press, and others. He is a black belt (second degree) in the Shotokan school of Karate, and is a senior instructor in the martial arts. As a translator he has been working for the last several years with a Hungarian colleague, Zsuzsanna Ozsváth, on a series of Hungarian poetry translations. They include a major collection of translations of the great Hungarian Jewish poet Miklós Radnóti, who perished in the Holocaust, a collection of the poems of Attila József, and a historically-organized anthology of Hungarian poetry. This work involves unusual methods and theories of translation; the originals, which are often in very strict Magyar meters, are rendered into the identical metrical forms in English, and the translation process is largely oral. The result has been praised for its accuracy and feeling by the Hungarian literary establishment, and greeted on its publication by critical acclaim. More recently he has collaborated with Ozsváth on a collection of translations of the poems of Goethe. He is a winner of the Milan Fust Prize (Hungary’s highest literary honor), the Levinson Poetry Prize (awarded by Poetry), the PEN Dallas Chapter Golden Pen Award, the Missouri Review essay prize, the David Robert Poetry prize, the Gjenima Prize, and several other literary, artistic and academic honors, and has participated in literary and TV projects that have respectively won a Benjamin Franklin Book Award and an Emmy. He is a fellow of the Texas Institute of Letters, and was nominated for the Nobel Prize for Literature in 2004, 2006, and 2007. Turner is presently at work on a collection of essays on the arts, a book on evolution and natural law, two new long poems, an anthology of Hungarian poetry in translation, and an anthology of Chinese Tang poetry in translation.